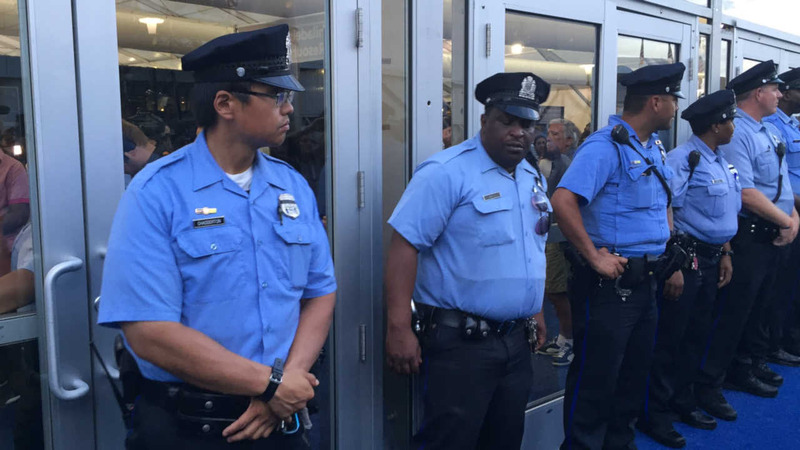 Philadelphia Police surround Hillary Clinton as Bernie Sanders delegates sit down inside one tent and refuse to leave. PHILADELPHIA, Pennsylvania (WABC) -- Moments after Hillary Clinton officially won the Democratic nomination for president, a large group of Bernie Sanders' supporters left the convention hall in Philadelphia to hold a sit-in protest at a nearby tent for journalists. Some supporters had their mouths taped shut. A few others sang "This Land is Your Land" and held a banner that read, "We The People." They say they're holding a peaceful protest to complain about being shut out by the Democratic Party. One protester is 64-year-old Talat Khan, of San Bernardino, California. He says: "It's for the betterment of our children and the future of our children." In the midst of the sit-in protest, one woman silently celebrated Hillary Clinton's historical nomination. Earlier Tuesday, Sanders asked the convention to nominate Clinton by acclamation. The delegates did so, to wild cheers inside the Wells Fargo Center.